A classic tongue-in-cheek MindShift post from last November is making the rounds on Twitter. For those who haven't seen it yet, I'm happy to repost here, just in time for back-to-school. According to a recent MSNBC article, 69% of high school currently ban cell phones. But you’d be hard-pressed to find a school anywhere that has enacted a blanket ban on pens and pencils. Here are 10 reasons to reconsider the widespread acceptance of these distracting and potentially dangerous implements. Pens and pencils are distracting. The tapping, clicking, flipping and rolling can drive just about any teacher around the bend. I remember a happy indoor recess spent throwing newly sharpened pencils at the classroom ceiling trying to make them stick. Writing implements are dangerous. I still have a small lump of lead imbedded in the soft, fleshy area between my thumb and pointer finger. It’s a souvenir from a mini-sword fight that occurred between my close friend and I in third grade. She won. Pens can be used to cheat. Now that I’m at the head of a classroom instead of behind a desk, I’ve seen some ingenious cheating techniques. One student managed to write an entire history of media studies on the bottom of their shoe. I’ve also found forearms covered with vocabulary words, ankles tattooed with definitions, and hands dyed with smeared blue ink. They are incredibly messy. Dusty pencil shavings litter the floor in many elementary classrooms and pens filled with liquid ink are just disasters waiting to happen. Have you ever tried to clean a child’s backpack after a pen broke at the bottom of the bag? No amount of scrubbing can get the dye completely out. Pens and pencils can be used to bully kids. Those notes that pass from hand to hand across the rows of desks are often far more sinister than they appear. Thanks to the ubiquitous use of writing implements in schools, kids have free reign to write and distribute messages that use offensive language and hateful speech. Recent high-profile cases of student bullying are just the latest examples of why we must crack down on these communication tools. Fancy pens and pencils will cause jealousy and other problems. I remember in fifth grade when the girl who sat across from me came to school with a brand new pack of orange, sparkly pens that wrote in neon ink. Her father had brought them back as a souvenir from a recent trip to Florida. They were the coolest and I wanted them, but they were too expensive for me to just go out and buy. Wouldn’t it be better to nip those kinds of issue in the bud by instituting a widespread ban on pens in schools. There are health concerns that can lead to bad habits. I think part of the reason I wore braces for six years stemmed from my lifelong habit of chewing pens and pencils. All that chomping in class had to affect my dental hygiene. They lead to sedentary behavior. Have you ever seen a child running with a sharpened pencil? Or, writing a note while playing kickball? Writing and exercise don’t mix. The obesity crises is reaching epic levels. 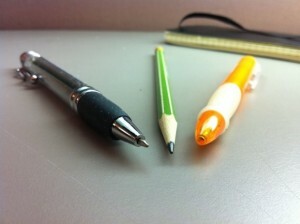 Let’s get pens and pencils out of our kid’s pudgy hands so they can get moving. They can be used to embarrass teachers. Sure, no teacher wants to see their goofs show up on YouTube, but a skillfully done caricature can do as much or more damage than photos or video. At least cameras and video capture actual events, when students are given free reign to create images, text or stories about their teachers, there’s no limit to the damage they can do. Let’s hope this blog post helps open people’s eyes to the danger of pens and pencils in schools. It’s high time someone spoke out in support of a ban on such hazardous tools.